Last month Borders announced the release of the $149 Kobo e-reader that will go head-to-head with the Amazon Kindle and the Barnes & Noble Nook. Cementing their strategy of remaining device neutral, Borders have today introduced a new partner, and a new e-reader that will go on sale in stores from early July. 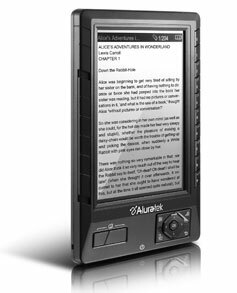 Aluratek, the manufacturers of the Libre eBook Reader, are the first addition to a number of planned third party partnerships. Rather than being focused on hardware, Borders is hoping to launch their own e-book store this month across a wide number of platforms. The Libre will be priced at $119.99 and features a 2GB SD card and support for PDF, RTF and ePub file formats. The eBook Reader utilizes a passive LCD screen rather than eInk and has a battery capable of 24 hours of continuous use. According to Borders, both the Kobo eReader and the Libre eBook Reader will be available on July 2.